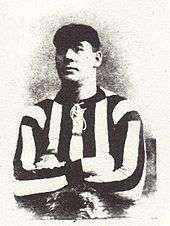 After retiring from playing, Griffiths trained local teams in Shirebrook before joining the British Army during World War I. He served with the 15th Battalion, Sherwood Foresters (Notts and Derby Regiment), reaching the rank of serjeant. The unit had originally been raised as a bantam battalion in Nottingham in 1915. By 1917 the battalion was part of 35th Division which was thrown into the Battle of Passchendaele in October 1917. Griffiths was killed in action on 30 October 1917, along with four others of his battalion (another 15 were wounded that day). 1 2 3 Joyce, Michael (2004). Football League Players' Records 1888–1939. Soccerdata. p. 108. ISBN 1-899468-67-6. 1 2 Triggs, Roger (1984). Gillingham Football Club: A Chronology 1893–1984. Kent County Libraries. p. 8. 1 2 3 4 "West Ham United: Fred Griffiths". Spartacus Educational. 2 September 2009. ↑ Gillatt, Peter (30 November 2009). Blackpool FC on This Day: History, Facts and Figures from Every Day of the Year. Brighton: Pitch Publishing Ltd. p. 28. ISBN 1-905411-50-2. ↑ Brown, Tony (2003). The Definitive Gillingham F.C. : A Complete Record. Soccerdata. p. 128. ISBN 1-899468-20-X. ↑ "Casualty Details: Griffiths FJ". Commonwealth War Graves Commission. Retrieved 2 September 2009. ↑ Baker, Chris. "The 15th Sherwood Foresters". The Long, Long Trail. Retrieved 2 September 2009. ↑ Baker, Chris. "The Sherwood Foresters (Nottinghamshire & Derbyshire Regiment)". The Long, Long Trail. Retrieved 2 September 2009.